The radioactive beta decay is due to the weak interaction, which transforms a neutron into: a proton, an electron, and an electron antineutrino. In particle physics, the weak interaction, which is also often called the weak force or weak nuclear force, is the mechanism of interaction between subatomic particles that is responsible for the radioactive decay of atoms. The weak interaction serves an essential role in nuclear fission, and the theory regarding it in terms of both its behavior and effects is sometimes called quantum flavordynamics (QFD). However, the term QFD is rarely used because the weak force is better understood in terms of electroweak theory (EWT). In addition to this, QFD is related to quantum chromodynamics (QCD), which deals with the strong interaction, and quantum electrodynamics (QED), which deals with the electromagnetic force. The effective range of the weak force is limited to subatomic distances, and is less than the diameter of a proton. It is one of the four known force-related fundamental interactions of nature, alongside the strong interaction, electromagnetism, and gravitation. The Standard Model of particle physics provides a uniform framework for understanding the electromagnetic, weak, and strong interactions. An interaction occurs when two particles (typically but not necessarily half-integer spin fermions) exchange integer-spin, force-carrying bosons. The fermions involved in such exchanges can be either elementary (e.g. electrons or quarks) or composite (e.g. protons or neutrons), although at the deepest levels, all weak interactions ultimately are between elementary particles. In the case of the weak interaction, fermions can exchange three distinct types of force carriers known as the W+, W−, and Z bosons. The mass of each of these bosons is far greater than the mass of a proton or neutron, which is consistent with the short range of the weak force. The force is in fact termed weak because its field strength over a given distance is typically several orders of magnitude less than that of the strong nuclear force or electromagnetic force. Quarks, which make up composite particles like neutrons and protons, come in six "flavors" – up, down, strange, charm, top and bottom – which give those composite particles their properties. The weak interaction is unique in that it allows for quarks to swap their flavor for another. The swapping of those properties is mediated by the force carrier bosons. For example, during beta minus decay, a down quark within a neutron is changed into an up quark, thus converting the neutron to a proton and resulting in the emission of an electron and an electron antineutrino. The weak interaction is the only fundamental interaction that breaks parity-symmetry, and similarly, the only one to break charge parity symmetry. Other important examples of phenomena involving the weak interaction include beta decay, and the fusion of hydrogen into helium that powers the Sun's thermonuclear process. Most fermions will decay by a weak interaction over time. Such decay makes radiocarbon dating possible, as carbon-14 decays through the weak interaction to nitrogen-14. It can also create radioluminescence, commonly used in tritium illumination, and in the related field of betavoltaics. During the quark epoch of the early universe, the electroweak force separated into the electromagnetic and weak forces. In 1933, Enrico Fermi proposed the first theory of the weak interaction, known as Fermi's interaction. He suggested that beta decay could be explained by a four-fermion interaction, involving a contact force with no range. However, it is better described as a non-contact force field having a finite range, albeit very short. In 1968, Sheldon Glashow, Abdus Salam and Steven Weinberg unified the electromagnetic force and the weak interaction by showing them to be two aspects of a single force, now termed the electroweak force. The existence of the W and Z bosons was not directly confirmed until 1983. 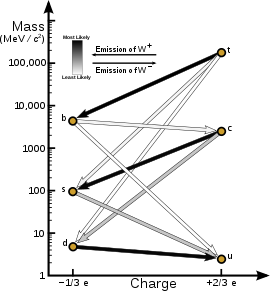 A diagram depicting the various decay routes due to the weak interaction and some indication of their likelihood. The intensity of the lines is given by the CKM parameters. It is the only interaction that violates P or parity-symmetry. It is also the only one that violates charge-parity CP symmetry. It is mediated (propagated) by force carrier particles that have significant masses, an unusual feature which is explained in the Standard Model by the Higgs mechanism. Due to their large mass (approximately 90 GeV/c2) these carrier particles, termed the W and Z bosons, are short-lived with a lifetime of under 10−24 seconds. The weak interaction has a coupling constant (an indicator of interaction strength) of between 10−7 and 10−6, compared to the strong interaction's coupling constant of 1 and the electromagnetic coupling constant of about 10−2; consequently the weak interaction is weak in terms of strength. The weak interaction has a very short effective range (around 10−17 to 10−16 m). At distances around 10−18 meters, the weak interaction has a strength of a similar magnitude to the electromagnetic force, but this starts to decrease exponentially with increasing distance. Scaled up by just one and a half orders of magnitude, at distances of around 3×10−17 m, the weak interaction becomes 10,000 times weaker. The weak interaction affects all the fermions of the Standard Model, as well as the Higgs boson; neutrinos interact through gravity and the weak interaction only, and neutrinos were the original reason for the name weak force. The weak interaction does not produce bound states nor does it involve binding energy – something that gravity does on an astronomical scale, that the electromagnetic force does at the atomic level, and that the strong nuclear force does inside nuclei. Its most noticeable effect is due to its first unique feature: flavor changing. 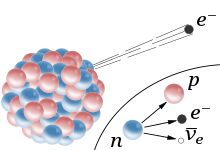 A neutron, for example, is heavier than a proton (its sister nucleon), but it cannot decay into a proton without changing the flavor (type) of one of its two down quarks to an up quark. Neither the strong interaction nor electromagnetism permit flavor changing, so this proceeds by weak decay; without weak decay, quark properties such as strangeness and charm (associated with the quarks of the same name) would also be conserved across all interactions. boson which is then converted into an electron and an electron antineutrino. Another example is the electron capture, a common variant of radioactive decay, wherein a proton and an electron within an atom interact, and are changed to a neutron (an up quark is changed to a down quark) and an electron neutrino is emitted. Due to the large masses of the W bosons, particle transformations or decays (e.g., flavor change) that depend on the weak interaction typically occur much more slowly than transformations or decays that depend only on the strong or electromagnetic forces. For example, a neutral pion decays electromagnetically, and so has a life of only about 10−16 seconds. In contrast, a charged pion can only decay through the weak interaction, and so lives about 10−8 seconds, or a hundred million times longer than a neutral pion. A particularly extreme example is the weak-force decay of a free neutron, which takes about 15 minutes. right-handed anti-particles with equal and opposite weak isospin. All right-handed (regular) particles and left-handed antiparticles have weak isospin of 0. All particles have a property called weak isospin (symbol T3), which serves as a quantum number and governs how that particle behaves in the weak interaction. Weak isospin plays the same role in the weak interaction as does electric charge in electromagnetism, and color charge in the strong interaction. All left-handed fermions have a weak isospin value of either +​1⁄2 or −​1⁄2. For example, the up quark has a T3 of +​1⁄2 and the down quark −​1⁄2. A quark never decays through the weak interaction into a quark of the same T3: Quarks with a T3 of +​1⁄2 only decay into quarks with a T3 of −​1⁄2 and vice versa. (as a right-handed antiparticle, +​1⁄2). where YW is the weak hypercharge of a given type of particle, Q is its electrical charge (in elementary charge units) and T3 is its weak isospin. Whereas some particles have a weak isospin of zero, all spin-​1⁄2 particles have non-zero weak hypercharge. Weak hypercharge is the generator of the U(1) component of the electroweak gauge group. bosons), and is responsible for the beta decay phenomenon. The second type is called the "neutral-current interaction" because it is mediated by a neutral particle, the Z boson. , the three carriers of the weak interaction) and the massless photon (γ, the carrier of the electromagnetic interaction). bosons of the weak interaction. The fourth gauge boson is the photon of electromagnetism, and remains massless. This theory has made a number of predictions, including a prediction of the masses of the Z and W-bosons before their discovery. On 4 July 2012, the CMS and the ATLAS experimental teams at the Large Hadron Collider independently announced that they had confirmed the formal discovery of a previously unknown boson of mass between 125–127 GeV/c2, whose behaviour so far was "consistent with" a Higgs boson, while adding a cautious note that further data and analysis were needed before positively identifying the new boson as being a Higgs boson of some type. By 14 March 2013, the Higgs boson was tentatively confirmed to exist. If the electroweak symmetry breaking scale were lowered, the unbroken SU(2) interaction would eventually become confining. Alternative models where SU(2) becomes confining above that scale are quantitatively similar to the Standard Model at lower energies, but dramatically different above symmetry breaking. The laws of nature were long thought to remain the same under mirror reflection. The results of an experiment viewed via a mirror were expected to be identical to the results of a mirror-reflected copy of the experimental apparatus. This so-called law of parity conservation was known to be respected by classical gravitation, electromagnetism and the strong interaction; it was assumed to be a universal law. However, in the mid-1950s Chen-Ning Yang and Tsung-Dao Lee suggested that the weak interaction might violate this law. Chien Shiung Wu and collaborators in 1957 discovered that the weak interaction violates parity, earning Yang and Lee the 1957 Nobel Prize in Physics. Although the weak interaction was once described by Fermi's theory, the discovery of parity violation and renormalization theory suggested that a new approach was needed. In 1957, Robert Marshak and George Sudarshan and, somewhat later, Richard Feynman and Murray Gell-Mann proposed a V−A (vector minus axial vector or left-handed) Lagrangian for weak interactions. In this theory, the weak interaction acts only on left-handed particles (and right-handed antiparticles). Since the mirror reflection of a left-handed particle is right-handed, this explains the maximal violation of parity. The V−A theory was developed before the discovery of the Z boson, so it did not include the right-handed fields that enter in the neutral current interaction. However, this theory allowed a compound symmetry CP to be conserved. CP combines parity P (switching left to right) with charge conjugation C (switching particles with antiparticles). Physicists were again surprised when in 1964, James Cronin and Val Fitch provided clear evidence in kaon decays that CP symmetry could be broken too, winning them the 1980 Nobel Prize in Physics. In 1973, Makoto Kobayashi and Toshihide Maskawa showed that CP violation in the weak interaction required more than two generations of particles, effectively predicting the existence of a then unknown third generation. This discovery earned them half of the 2008 Nobel Prize in Physics. Unlike parity violation, CP violation occurs only in limited circumstances. Despite its rarity, it is widely believed to be the reason that there is much more matter than antimatter in the universe, and thus forms one of Andrei Sakharov's three conditions for baryogenesis. ^ Fermi, Enrico (1934). "Versuch einer Theorie der β-Strahlen. I". Zeitschrift für Physik A. 88 (3–4): 161–177. Bibcode:1934ZPhy...88..161F. doi:10.1007/BF01351864. ^ Wilson, Fred L. (December 1968). "Fermi's Theory of Beta Decay". American Journal of Physics. 36 (12): 1150–1160. Bibcode:1968AmJPh..36.1150W. doi:10.1119/1.1974382. ^ "Steven Weinberg, Weak Interactions, and Electromagnetic Interactions". ^ "1979 Nobel Prize in Physics". Nobel Prize. Archived from the original on 7 July 2014. ^ W.-M. Yao et al. (Particle Data Group) (2006). "Review of Particle Physics: Quarks" (PDF). Journal of Physics G. 33: 1–1232. arXiv:astro-ph/0601168. Bibcode:2006JPhG...33....1Y. doi:10.1088/0954-3899/33/1/001. ^ Peter Watkins (1986). Story of the W and Z. Cambridge: Cambridge University Press. p. 70. ISBN 978-0-521-31875-4. ^ a b c J. Christman (2001). "The Weak Interaction" (PDF). Physnet. Michigan State University. Archived from the original (PDF) on 20 July 2011. ^ Walter Greiner; Berndt Müller (2009). Gauge Theory of Weak Interactions. Springer. p. 2. ISBN 978-3-540-87842-1. ^ Baez, John C.; Huerta, John (2009). "The Algebra of Grand Unified Theories". Bull. Am. Math. Soc. 0904: 483–552. arXiv:0904.1556. Bibcode:2009arXiv0904.1556B. doi:10.1090/s0273-0979-10-01294-2. Retrieved 15 October 2013. ^ a b K. Nakamura et al. (Particle Data Group) (2010). "Gauge and Higgs Bosons" (PDF). Journal of Physics G. 37. Bibcode:2010JPhG...37g5021N. doi:10.1088/0954-3899/37/7a/075021. ^ K. Nakamura et al. (Particle Data Group) (2010). "n" (PDF). Journal of Physics G. 37: 7. Bibcode:2010JPhG...37g5021N. doi:10.1088/0954-3899/37/7a/075021. ^ a b C. Amsler et al. (Particle Data Group) (2008). "Review of Particle Physics – Higgs Bosons: Theory and Searches" (PDF). Physics Letters B. 667: 1–6. Bibcode:2008PhLB..667....1A. doi:10.1016/j.physletb.2008.07.018. ^ "New results indicate that new particle is a Higgs boson | CERN". Home.web.cern.ch. Retrieved 20 September 2013. ^ Claudson, M.; Farhi, E.; Jaffe, R. L. (1 August 1986). "Strongly coupled standard model". Physical Review D. 34 (3): 873–887. doi:10.1103/PhysRevD.34.873. Retrieved 4 February 2019. ^ Charles W. Carey (2006). "Lee, Tsung-Dao". American scientists. Facts on File Inc. p. 225. ISBN 9781438108070. ^ M. Kobayashi; T. Maskawa (1973). "CP-Violation in the Renormalizable Theory of Weak Interaction" (PDF). Progress of Theoretical Physics. 49 (2): 652–657. Bibcode:1973PThPh..49..652K. doi:10.1143/PTP.49.652. hdl:2433/66179. ^ Paul Langacker (2001) . "Cp Violation and Cosmology". In Cecilia Jarlskog (ed.). CP violation. London, River Edge: World Scientific Publishing Co. p. 552. ISBN 9789971505615. R. Oerter (2006). The Theory of Almost Everything: The Standard Model, the Unsung Triumph of Modern Physics. Plume. ISBN 978-0-13-236678-6. Walter Greiner; B. Müller (2000). Gauge Theory of Weak Interactions. Springer. ISBN 3-540-67672-4. G.D. Coughlan; J.E. Dodd; B.M. Gripaios (2006). The Ideas of Particle Physics: An Introduction for Scientists (3rd ed.). Cambridge University Press. ISBN 978-0-521-67775-2. W.N. Cottingham; D.A. Greenwood (2001) . An introduction to nuclear physics (2nd ed.). Cambridge University Press. p. 30. ISBN 978-0-521-65733-4.